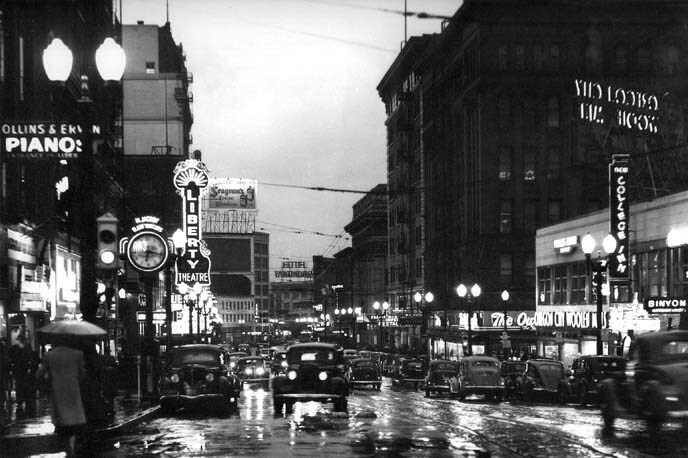 A Rainy Night in Portland, 1936. Thanks to the restoration movement, much of downtown Portland still looks like this. These ancient questions are with us still. With only the slightest of changes, they can be recast into a form that provides a guidepost to the music lover, the audiophile, the hobbyist, and the artisan-engineer. Where does the art of sound reproduction come from? What do I seek from this art? In the first years of Electrical Amplification, engineers had their hands full just trying to master the complex and non-intuitive mathematics of vacuum tube amplifiers and oscillators. It is worth keeping in mind that vacuum tubes were electronics in the first half of the Twentieth Century; before Lee DeForest modified Edison's light-bulb, the only form of "amplification" were relays that could repeat and rebuild telegraph signals. Radio relied on tuned circuits, massive brute-force spark-gap transmitters, large long-wave antennas, and crystal-diode rectification that directly powered the headphones. The faint signal that wiggled the headset diaphragm was a infinitesimal fraction of the megawatts that poured in all directions from the transmitter. Records, of course, were purely mechanical and acoustic, and wouldn't work at all if it weren't for horn-gain in recording and playback. What we now think of as electronic engineering back then was electrical engineering, focussed on keeping AC power transmission systems in phase and specialized techniques for pushing a telephone-audio signal down hundreds of miles of wire without benefit of amplification. In the 1910's, the engineers of the Bell Telephone System improved the unreliable and short-lived DeForest Audion by increasing the vacuum, removing manufacturing impurities, establishing the requirement for negative bias, and creating the first mathematical models of diode rectification and triode amplification. The Bell System desperately needed to improve the quality and reliability of long-distance service, and the amplification provided by the first triodes answered the need. Radio Corporation of America was created as a US government monopoly during the first World War to employ the vacuum tube for improved radio reception, and as a direct result, ended up controlling most of the patents for vacuum-tube technology for the next two decades. In the early 1920's, Major Armstrong (who went on to invent and patent superregeneration, the superheterodyne, and FM radio) built on the work of Bell Labs and RCA by accurately characterizing the electrical behavior of the simple triode and establishing the requirements for correct biasing and plate loading. All of these developments opened the door for rational and predictable design of audio and radio-frequency (RF) amplifiers, which led to a very rapid expansion of the radio industry, public address systems, movie sound, and the introduction of electrical phonograph recording and playback. It is worth contemplating when we pat ourselves on the back for the rapid progress of the Internet that the entire field of electronics went from a strange laboratory curiosity (before World War I), to the first AM radio broadcasts by KDKA in 1920, to a mature and very fast-growing field (dominated by enormously profitable monopolies) at the beginning of the Thirties. One aspect of the new maturity of electronics was the idea that music could actually sound something like the concert-hall experience. You no longer had to shout into the telephone if you made a city-to-city call; sensitive radios could tune in broadcasts across continents; it was now possible for police in radio cars and pilots in aircraft to talk to central stations and get directions. Electronics had arrived, but considering what was possible, much more could be done. In the days of noisy, fast-wearing 78rpm records and narrow bandwidth AM broadcasting (the highest-quality long-distance lines of the Bell System limited the signal to 50Hz - 8kHz), the best that could be hoped for was "Good Tone." Although hundreds of manufacturers of radios and phonographs were continually striving to improve quality, the built-in limitations of shellac records and the AM broadcasting networks made it difficult to go very far in improving loudspeakers and amplifiers without further exposing the problems of the source. This is why the early subjective studies by Bell Labs about the prospects for high-fidelity were rather unpromising; prototype microphone and speaker drivers did actually go from 40 Hz to 15 kHz (or rather, kilocycles), but after shellac records and AT&T long lines got through with the signal, the extra bandwidth added aggravation and fatigue, not listening pleasure. It's always worth keeping in mind when looking at old schematics that low-noise, wideband signal sources simply didn't exist back when the designs were new, and that modern triode fans are having a completely new experience when playing them with modern signal sources and loudspeakers. The major advancements of the Thirties came from the movie industry, which was free to build complete sound systems from the ground up. The Hollywood studios were vertically integrated businesses, with each studio owning their own chain of theaters. This meant the studio controlled everything from the performer, to the microphone, to the auditorium, and everything in between. There was no need to fit anything into the restrictions of commercial radio, records, or consumer-grade electronics. Each studio was in direct control of the entire artistic, technological, and commercial experience of "going to the movies." Movie producers and directors quickly discovered that sound was the heart and soul of the movie, conveying emotions powerfully through music, underpinning the dialog and the images, giving the "talkie" a profound emotional impact denied the silents. The "talkie" aspect removed the tedious need for title cards, but the impact of music and sound-effects made it possible to make new kinds of movies that affected the audience in a deeper way than before. The standard art criticism of early sound-film rightly focusses on the loss of camera-movement freedom that happened in the early Thirties (the first "blimped" cameras were extremely large and heavy). What has been forgotten is that producers and directors entered a new artistic realm with live dialog and music, a change that ushered in a more subtle and intimate form of acting, and musical moods that mirrored the inner feelings of the characters. After sixty years, we take this for granted, but the combination of sound and film created a medium that was unexpectedly different from its component elements of music on records and silent film. The movie industry quickly discovered that improved fidelity (from optical sound, better amplifiers, and better speakers) deepened the emotional effect of the sound-track. For the first time in the history of the movie industry, sound quality, even if it wasn't consciously noticed by the audience or the critics, became a powerful and profitable box-office draw. In 1936, the first demonstration of long-distance high-fidelity using all-FM transmitters, repeaters, and receivers by Major Armstrong and his affiliated FM Network. This could well have been the first public demonstration and commercial sale of full-frequency-range, low-distortion, high-fidelity sound for a mass audience. The Yankee FM Network and its national affiliates was almost certainly the first opportunity the public had to experience full-frequency-range, wide-dynamics, and low distortion on a day-to-day basis. The only alternatives were noisy shellac 78rpm records, low-fi network AM with limited-bandwidth intercity relays, and optical soundtracks with modest performance at best. Armstrong's network was the first complete high-fidelity system to make it out of the lab into the hands of the public - and the original high-power, low-band Armstrong FM system continued broadcasting until 1945, when the FCC moved the FM spectrum to its current location of 88 to 108 MHz. Two and three-channel stereo sound demonstrations by RCA, Western Electric, and Alan Blumlein, and the first full-length movie to use a multichannel soundtrack, Walt Disney's Fantasia, released in 1940. Low-distortion, full frequency range microphones, phono pickups, amplifiers, and speaker systems from Western Electric, RCA, Decca, EMI, and others. The most advanced equipment was used for transcriptions of radio shows (via 16 and 33rpm acetate masters) and in high-end radio sets. Electroacoustic analysis and modelling of microphones, moving-coil cutterheads, optical modulators for movie soundtracks, phono pickups, direct-radiator loudspeakers, and theatre horns. The first widely used vacuum tube was the direct-heated (usually battery powered) was the RCA '01A direct-heated triode in 1922. This became the general-purpose tube of the 1920's - in the late Twenties, specialized tubes appeared, starting with the indirect-heated RCA '27, followed by the closely related 37, 56, and 76. These low-level tubes made AC-powered radios possible, since they didn't require battery power for hum-free operation. If you ever want to put a solid-state designer on the spot, ask them which transistors were designed for high-fidelity audio applications ... and are they still on the market, ten or twenty years after they introduced? You can expect a long silence after this question - when a transistor model goes out of production, that's it. Don't expect to find stocks of obsolete transistors, and you can be very sure that nobody wants to collect them or use them in a vintage-sound product. The sad fact is that solid-state devices have linearity well down on the list of design priorities, with feedback needed to clean up devices that were never primarily intended for audio. The automotive equivalent would be cars modified to use truck diesels ... OK for Soviet Russia maybe, but do you think you'd want to buy something like that if you had a choice? Yet this is the state of affairs in solid-state audio, with the electronic equivalent of an industrial diesel pressed into service in so-called "high-end" electronics. Bi-amplification for lower speaker & amplifier distortion and wider dynamic range. This was used in theatre systems, sound reinforcement, and top-of-the-line radio sets. And many other innovations still in use today. The "Golden Age" of High-Fidelity in the Fifties and the "Ultra-Fi" direct-heated triode movement in the Nineties onward have drawn deeply from the wellspring of knowledge created in this decade. The papers of Major Armstrong, Alan Blumlein, and the RCA and Western Electric research labs make fascinating and instructive reading today. In audio, we truly stand on the shoulders of giants. No succeeding era was even remotely comparable to the accomplishments of the Thirties - what followed was more of a process of consolidation and a gradual diffusion of technology out of the laboratories to more and more listeners at lower and lower prices. Anytime you read a glossy ad in a magazine, or see an animated corporate logo in the movie theater, think back on what the pioneers created with little more than knowledge of fundamentals, adding-machine calculators, and slide rules. It is a little sobering to realize the time we've wasted making digital recording approach the quality of the analog tape and LP's they needlessly replaced ... 20 years ... is the same time span from primitive Edison cylinders and crystal radio to all-FM broadcast networks and 3-channel Stereophonic Sound (called Auditory Perspective back then). We have more audio engineers than ever, and far superior analytical tools, but what does mainstream audio engineering have to show for the last two decades? Seriously? Crap like AC-3, MP3, and AAC digital compression techniques? Watermarking techniques that are inaudible to teenagers listening on Internet-downloaded MP3s? With the industry's Best and Brightest working on projects like these, is it any wonder that progress is coming from industry outsiders? The War Years of the Forties represent a fallow period for audio, as the best minds of the electronics industry turned away from audio to devote their energies to building high-frequency radar systems, and after the war, the fast-growing television industry. This period also represents a turning of the generations, as the first wave of audio pioneers passed the baton to the engineers who would later build the Golden Age of High-Fidelity in the 1950's. One of the most important developments of the late 1940's was the introduction of the Williamson amplifier, which finished off the use of power triodes in high-fidelity (except for a very small group of French, Italian, and Japanese hobbyists). With the introduction of the high-feedback, high-power, and high-efficiency KT66 Williamson, the great power and distortion-lowering race began in earnest, and would continue relentlessly for the next 40 years. Although it may seem easy in retrospect to criticize the high-feedback Williamson now, we should remember what the speakers of the late Forties were like: there was no real understanding of the properties of closed-box or vented-box systems, and most speakers were boomy or thin-sounding (mistuned) by modern standards. With a closed box (known then as infinite-baffle or acoustic-suspension), the tuning problem is straightforward ... just adjust the box volume for flattest response and best sound. Build two or three boxes, and one is bound to be right. However, a vented box is a fourth-order system, and system tuning becomes horrendously difficult by the cut-and-try methods then available. Even something as basic as measuring a closed or vented box is quite a difficult trick. Modern analytic and near-field measuring techniques were still 20 years in the future, awaiting the Audio Engineering Society (AES) publication of the Neville Theile and Richard Small papers in 1971. The high damping (due to high feedback) of the Williamson was just what the boomy speakers of the day needed, offering a genuine improvement in bass quality. The increased power was also appreciated, since the 2A3 was the only power triode then available to the public ... the much larger 300B was not available to the public, and the 211 and 845 transmitting triodes require large and dangerous high-voltage supplies. The combination of high power, high damping, and easily available power tubes in the 6L6, 807, KT66, and 5881 family met the needs of a new generation of postwar audiophiles. The Williamson was so successful that it swept nearly all other circuits aside; a review of American hi-fi magazines from the late Forties to the mid-Fifties shows one Williamson article after another, with rare exceptions for McIntosh, Quad, or the oddball novelty circuit. The spell of the Williamson was finally broken in 1957-59, with a flurry of new Ultralinear EL34 and KT88 products from Dynaco, Acrosound, Marantz, and Citation. A more significant event of the late Forties was the introduction of the Ampex magnetic tape recorder, based in turn on captured German Magnetophon AC-bias machines. What was a little odd was that the German AC-bias technology was known in America and the UK before the war, but ignored by the English-speaking audio industry in favor of lo-fi wire recorders using DC bias (dictation machines). In the immediate postwar period, the problems with manufacturing iron-oxide coated magnetic tape were mastered by 3M, and the new Ampex tape recorders quickly surpassed the German originals. The introduction and rapid improvement of magnetic tape recording was the prerequisite for the broad advances of the 1950s. The advent of high-quality 30 and 15 IPS master-tape recording (which still sound astonishingly good 50 years later ... check out the RCA Living Stereo and Mercury Living Presence reissues) meant that the recording, movie, and broadcasting industries finally had the means of making superior-quality original productions ... but no way of distributing them to the public! The fruits of this research ignited the second wave of audio, the Golden Age of the 1950's. At the same time in the early Fifties, the broadcast industry opened hundreds of new high-quality FM "Good Music" stations carrying classical, jazz, and light popular music. The new FM stations were subsidized by the established mass-market AM stations, allowing FM stations to carry more specialized programming. In the United States, the era from the early Fifties to the mid-Sixties represents a high-water mark for musical and technical broadcast quality, which has never been equalled before or since. The quality that is taken for granted in Europe or Japan was gradually driven out of the US market by commercial market-share considerations that eventually resulted in FM mimicking the technical and programming practices of the AM market. It's no accident the era of the best FM tuners mirrors the best broadcasting. The history of audio shows that program and technical quality go hand in hand; when one go up, the other follows, and when one goes gown, the other follows. All of these parallel advances (which happened in less than a decade!) led to the birth of a new industry, quite separate from the mass-market radio-phonograph consoles ... the "High Fidelity" industry. The industry grew in direct response to the explosion of high-quality music from many different sources; without all of these new sources of high-quality, high-fidelity music, there couldn't have been a Golden Age of audio. Many treasures from this era still delight us today ... truly wonderful recordings that are clearer, more natural, and more lifelike than contemporary digital recordings made 40 years later. We also have legacy of superb products made by Acrosound, Altec, Ampex, Brook, H.H. Scott, Fisher, JanZen, Leak, Marantz, McIntosh, Ortofon, Quad, REL Precedent, Tannoy, and Thorens, to name just a few. Even the budget-priced Dynaco Stereo 70, made in the hundreds of thousands, still gives great musical pleasure with the very latest speakers and SACD players of the new Millenium! This was a period when the pioneering advances of the Thirties spread out across the world, with many millions now enjoying high-fidelity for the first time. The decade saw a major transition from a hobbyist-driven pastime to a widespread domestic industry, with products growing more elegant, easier to use, and domestically acceptable. Amplifiers became more powerful, receivers were introduced, and speakers followed the lead of AR and KLH in getting smaller. Relative to the precipitous decline of the early transistor era, though, the sonic compromises of the 1950's were moderate, and more than offset by a great abundance of new music from stereo reel-to-reel tape, superb LP recordings, and live FM radio transmissions (with none of the compression and dynamic EQ that is standard commercial FM practice today). One of the things not mentioned in the current nostalgia boom for the 1950's is that the pace of technological and social change in the late Fifties and Sixties was stunningly fast ... much faster than the last twenty years, which has a great deal of excitement in the computer field, but precious little elsewhere, and is actually a period of social and political reaction. For us, the future is a subject of grim fantasy in movies and fiction, but back then, it was very real and something to get excited about. In the time-span of 1954 to 1964, TV changed from black-and-white to color, audio changed from table radios and massive "French Provincial" consoles to elegant stereo components, very high-quality FM radio became widespread, aircraft changed from slow and noisy Super Constellations and DC-7's to fast and quiet Boeing 707's, interstate travel changed from congested 2-lane roads with many traffic lights to freeways, and space exploration changed from an impossible science-fiction dream to everyday reality. The social changes were equally profound ... rock-n-roll emerged from the unsavory ghetto of "race music", the civil rights movement began to reverse centuries of racial brutality, and the stodginess, conformity, and social repression of the 1950's relaxed into the Utopian freedom and experimentation of the 1960's. As stereo sound gradually replaced mono, the large horn and infinite-baffle speakers of the early 1950's fell out of favor. It's one thing to have a handsome big speaker in the corner of the room ... after all, it's kind of a conversation piece, like a grand piano ... but two behemoths (with additional demands for stereo symmetry in room placement) are quite another story! The advent of stereo moved the "bookshelf" speakers (so-named because they were always shown in the advertisements of the day as fitting in a bookshelf of a built-in library) from a New York studio-apartment curiosity to the hi-fi mainstream. Acoustic Research was the pioneer with the "acoustic-suspension" principle used in the AR-1 in 1954, and as the decade moved on, the AR-3, AR-2, and AR-4. Kloss, one of the co-founders of AR, went on to form KLH, which made speakers very much in the pattern of the original AR family. It wasn't just small size that made the bookshelf speaker a success. The AR and KLH speakers had much flatter frequency response than the big competitors, and the smaller cabinets were far more rigid than the large and thin plywood cabinets of the old-timers. Although the big speakers had lots of dynamics and impact, the AR's and KLH's had much less coloration, and introduced the concept of accuracy to the public at large. In North America and Britain, the low-efficiency compact speakers became the dominant metaphor for true high-fidelity, and the big horns were seen as archaic and regressive. In other parts of Europe and Japan, though, the big horn speakers never lost their following, since audiophiles in those markets put more value on dynamic range and low distortion than flat response and "accuracy" in the Anglo-American sense. At the same time as AR and KLH were making a big splash in North America, D.E.L. Shorter of the BBC was laying the foundation of modern speaker design by uncovering and measuring the elusive "delayed resonance" that didn't show on up on conventional swept frequency measurements ... eventually leading to the FFT and MLS techniques used today. Although it took many decades, the delayed resonance measurement technique finally made it possible to build conventional dynamic speakers that rival the single most advanced speaker of the 1950's ... the Quad electrostat. The first Quad electrostat (abbreviated either as ESL57 or ELS57) occupies a very select circle of classic speakers that still sound "modern", even advanced, today. Even in strictly objective terms, the Quad has superb transient response, with nearly perfect square waves, as well as vanishingly low IM distortion. Very few modern speakers combine excellent transient response with low distortion; most speakers, then as now, force the buyer to choose between very low IM distortion (horns and studio monitors) and excellent impulse response (linear-phase audiophile speakers). As efficiencies of the "bookshelf" speakers gradually dropped, amplifier power increased to compensate, with the 15 watts of the KT66/6L6 Williamson growing to the 35 watts of EL34 family of amplifiers and the 60 watts of the KT88/6550 family. The enduring classic of this era is the well-loved Dynaco Stereo 70, with over 500,000 in production over 30 years. Although the circuit of this amplifier is hardly sophisticated or even particularly linear, a carefully-restored Stereo 70 still sounds better than many high-end amplifiers made today! In 1963, the FCC selected the Zenith subcarrier system for stereo FM (which was probably not as good as the Crosby FM-FM system, but still a reasonably good choice), and now FM radio became stereophonic as well. The only offshore competitor was the inferior Halstead system, which was actually a mono signal steered left and right by a low-frequency control signal. Fortunately, when the BBC was deciding on a stereo FM system, they were wise enough to discard the home-grown system, and adopt the foreign Zenith system. In time, the Zenith system became a world standard, a rare example of international harmony in broadcasting standards. Anyone who has followed the endless wrangling regarding color and high-definition television knows how rare it is for US and European technical committees to agree on anything! Stereo sound for television was set aside in 1964 by the FCC at the request of the three major TV networks (so they could avoid additional costs at the time they were converting to NTSC color). Stereo television sound would have to wait 20 years for the eventual adoption of a system that was remarkably similar to the original Zenith proposal (with the addition of DBX compression for the L-R difference signal). Any discussion of golden-age hi-fi always gets around to speakers. Thoughtfully restored electronics from the period give impressively good ... and very modern ... sound when put in a contemporary system with reasonably efficient speakers. What about restored Golden Age speakers? It's not so simple with speakers. Yes, there are a few classics, starting with the legendary Quad ESL. Bear in mind that the Quad has very serious problems with dynamic range compared to modern speakers, and the "sweet spot" for stereo is little more than 2 feet (or less). The dynamic drivers are a tough choice: the sonics of the West Coast high-efficiency classics like JBL's and Altecs are not to everyone's taste (especially classical-music fans), and the East Coast favorites like the AR and KLH are inefficient and low in resolution (high IM distortion, crude crossovers). The tweeters are typically very poor, with high distortion, lots of stored energy, rough response, and ragged polar patterns. Tweeters and phono cartridges are intimately dependent on materials technology, and in all honesty, the materials we take for granted today weren't available to NASA or the SR-71 Blackbird Skunkworks team back then. But again, even here there are exceptions. Cone tweeters are unjustly forgotten, especially the Bozak and Peerless 2" paper cones with a 3/4" aluminum dustcap. These are really quite good, and far better than the wretched dome tweeters of the era. It wasn't until the Nineties that 1" dome tweeters began to catch up with the cone tweeters of the Fifties and Sixties. Vintage horn tweeters are anywhere from really terrible to pretty good; just don't expect anything beyond 15 kHz or broad dispersion. I still prefer the sound of phenolic diaphragms to aluminum - one of the reasons I've never warmed up to the Altec/JBL sound, which has always sounded metallic to my ears. Dome midranges, then as now, are pretty dreadful, with very high IM distortion thanks to side-to-side rocking (no spider, after all). The old-school East Coast speakers are essentially impossible to modify, because after you replace the drivers, the enclosure, the crossover components, the box filling, the grill cloth, and the speaker wire, all that's left of the original is the logo on the front. What's desirable are paper-cone drivers with Alnico magnets ... although the Qt may be impossible to use in a flat-response closed or vented box. (Look for Qt between 0.2 and 0.38; any lower, and there will be a very high F3 frequency, any higher, and the alignments start to get unreasonable in terms of box size and response shape.) Be aware that drivers intended to be used in horns have very limited excursion, and may even be destroyed if used in a closed or vented box. The reputation of Alnico magnets is not just hype and hokum; the difference is real, and the reason is simple. All dynamic drivers are inductive at some frequency; for a bass or midbass driver, the inductance becomes significant from 300 to 500 Hz on up (even if the measured frequency response is flat to 3 kHz). The electrical rolloff due to voice-coil inductance is counteracted by a rising mechanical response (just like a moving-magnet cartridge). The voice-coil inductance is always there, and always in series with the audio signal path; what goes unnoticed is exactly what kind of inductor it really is. Well, of course, it's an iron-core inductor, so there are linearity issues to contend with. Not surprisingly, ferrite-core inductors are very different animals than Alnico-core inductors. The best of all would be soft iron, as used in antique electromagnet speakers, but you have to go back to the Thirties for that technology (or have them built in Japan). The copper-clad pole-piece of modern Scan-Speak, Skaaning, and Vifa drivers is a good start, getting rid of 60-90% of the VC inductance, but's what left is still that ferrite core. One day, just maybe, we'll see a modern speaker with a copper pole piece and an Alnico or electro-magnet. This would be very interesting and would combine the virtues of the Thirties, Fifties, and Nineties all in one driver. Until then, you can choose between vintage sound (with the charms of high efficiency and Alnico magnets) and modern drivers with their very low coloration and high-tech cones. The advancements in audio electronics since the Golden Age have been in cost and size reduction, not audio quality. In real dollars, electronics are far. far cheaper now than they were 40 years ago. A Sears Silvertone table radio, for example, cost $39 in 1956 dollars, back when gold was $35 an ounce, a Chevrolet Bel Aire $1295, or a nice house $10,000. That effectively makes a basic Silvertone AM radio $400 to $1000 in modern terms. Would anyone pay $1000 for a table radio now? Of course not (unless it was Bang & Olufson maybe). But despite the truly impressive cost reduction, it's difficult to claim that modern electronics are actually better in musical terms. They measure better, but the actual physical devices that do the work are industrial castoffs with very complex nonlinearities. By contrast, speaker technology has advanced since the Golden Age, mostly thanks to materials technology and greatly improved modelling. But the advances have been uneven, with setbacks in efficiency, IM distortion, aggressive cost-cutting, and unsatisfactory musical balances. This makes choosing a vintage speaker a more challenging decision. As mentioned above, my personal preferences would be drivers that would combine the best of each era ... efficiency, low IM distortion, modern cone materials and suspensions, and voice-coil-friendly magnets. © Lynn Olson 1996, 2005. All Rights Reserved. First published as "The Soul of Sound" by Lynn Olson, revised and updated in 2005.